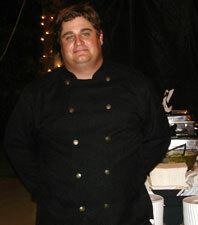 Andrew Vander Stoep is a native of Phoenix who developed his distinctive flair for food as Executive Chef at fine restaurants as well as an award winning national barbecue competition team leader. His culinary travels have taken him all over the United States and to Canada, France and Spain in search of that special combination of flavor and technique that has become his trademark. Whether your event is an outdoor barbecue with apple wood smoked ribs and chicken; a wedding with appetizers, filet mignon, grilled salmon and fine china; a casual drop off lunch for the office; or a company picnic for 5000 with hot dogs and hamburgers, Andrew’s BBQ is Phoenix’s first choice for great food and exceptional service. Let our professional staff assist you in the planning of every part of the event including just the right menu items along with additional services such as photographers, bartenders, musicians, and custom desserts. From award winning barbecue to elegant plated weddings and everything in between, Andrew’s BBQ Catering will ensure that the food as well as the service on your special day will be unforgettable.